It was a wonderful stay. The home is beautifully decorated! Layout was perfect for our party of 10. Location was fabulous! This was a great place to stay! There was plenty of room for the large group we brought down. The house had everything we could have wanted and more. We went for bike rides, walked to town and the beach. We especially enjoyed our mornings on the huge swings out on the balcony. Great home, great place to stay. We have stayed up and down the gulf coast - and several times in or near Rosemary Beach. This house and location were absolutely the best. Close to everything that we needed. So much space - and everything was very well kept. I would not hesitate recommending this property to anyone, and I cannot wait to stay here again. Absolutely incredible - beautiful, new and spacious home, perfect location in the heart of everything and every amenity you could ask for, "Viva la Vida" is indeed "living the life!" The home is absolutely beautiful - no small details were overlooked and it could easily be AAA Diamond rated! For the kids, everything was accessible and they absolutely loved the bunkroom and common areas that were all their own. The bikes, front yard (a unique feature on 30A) and proximity of the shops, restaurants, beach and gorgeous pool made them feel like they were having a vacation of their own! For the parents, life was easy - everything was provided for and we had had privacy, convenience and every amenity provided - we just showed up and enjoyed. The bar area on the third floor with its private deck made us feel like we were in our own private hotel rooftop with beautiful views on the Gulf and its sunsets. And whether we were heading out for the night or staying in, everything was in reach and easy. Rare for a vacation with tons of kids to actually be relaxing, but this house did just that - our only complaint? We only spent a week there! Sending your kids to the beach down the block? Done. Letting them take a short bike ride to the shops of Rosemary on their own? So. Cool. And for the older couple in our group, the elevator made everything smooth and easy - not to mention the privacy of the carriage house......which would have made a perfect home for the week on its own. Wow. This is the place to rent. Cannot wait to get back as soon as possible!!! This brand-new beautifully decorated home is perfectly located!! 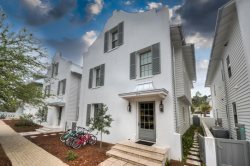 It's very close to Rosemary Beach and all the activities however it's a block or so away which provides peace and quiet and access to the beach is just a small stroll or bike ride down to what seemed to be a semiprivate beach!! It's very easy to have multiple families in this house as there's three floors with large bathrooms. The beds are extremely comfortable -which help me catch up on some much needed sleep. Really enjoyed the kitchen and dining area because it is open to the living room which allows for a wonderful open entertaining environment for large groups but still feels quaint so fitting if it was just a couples getaway as well. BIG BONUS you can view the sunset from the spacious patio on the third floor while grilling on the which is built-in grill with large dining table. Nothing better than eating a grilled steak and glass of wine watching the sunset on the crystal blue Florida coastal waters!! This brand-new beautifully decorated home is perfectly located!! It's very close to Rosemary Beach and all the activities however it's a block or so away which provides peace and quiet and access to the beach is just a small stroll or bike ride down to what seemed to be a semiprivate beach!! It's very easy to have multiple families in this house as there's three floors with large bathrooms. The beds are extremely comfortable -which help me catch up on some much needed sleep. Really enjoyed the kitchen and dining area because it is open to the living room which allows for a wonderful open entertaining environment for large groups but still feels quaint so fitting if it was just a couples getaway as well. BIG BONUS you can view the sunset from the spacious patio on the third floor while grilling on the which is built-in grill with large dining table. Nothing better than eating a grilled steak and glass of wine watching the sunset on the crystal blue Florida coastal waters!! Definitely will return!! !